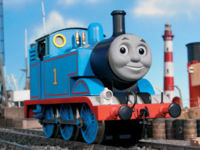 The Thomas the Tank Engine books are a series of children's books about steam trains created by the Reverend W Awdry and have since been made into a children's television show narrated by Ringo Starr of Beatles fame. Despite being created by a Christian minister, the show promotes liberal values regularly, with extreme amounts of political correctness in some of its later casting choices and including narrators with a lack of morals, such as Alec Baldwin and even comedian George Carlin. This page was last modified on 19 April 2017, at 22:31.